Then when Monday rolls around, the online casino will calculate all of the CP players have earned at the blackjack tables. Finally, each Tuesday (if not sooner), all players who’ve qualified for a free bonus chip will receive an email containing a corresponding bonus code, which can be redeemed for the value of the player’s qualifying bonus. 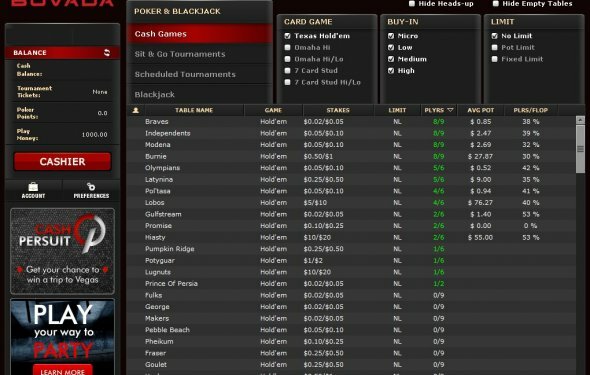 While every blackjack title at Bovada generates Casino Points, and is eligible for gameplay towards earning free chip bonuses, not all variants of the game generate CP in the same manner. The majority of Bovada blackjack games deliver 1 CP for every $10 wagered. However, wagers on Single- and Double-Deck Blackjack only accrue 1 CP for every $25 wagered. Note: For players logging into the Bovada Mobile / Tablet Casino, only standard Blackjack and Zappit Blackjack are available, thus all cumulative wagers of $10 will award 1 CP. When a player redeems their free bonus chip by logging into the online casino and visiting the ‘My Promotions’ section, they will have to complete wagering requirements associated with the bonus before requesting a withdrawal of any winnings. The promotional terms state that 20x wagering requirements must be met. Thus a $10 bonus chip would necessitate $200 in wagers, where the maximum $100 chip would require wagers equal to $2, 000. Note that some Bovada blackjack games do not count towards the fulfillment of wagering requirements. Any bets placed on Single Deck Blackjack, Double Deck Blackjack or Mini Blackjack (found in the Bovada Sportsbook/Racebook) will not generate playthrough. Shuffle Master, Inc. is a manufacturer of shuffling machines, table games, slot machines, and other casino products, based in Paradise, Nevada, near Las Vegas. The company's table game products include Let It Ride, Three Card Poker, Blackjack Switch, and Casino War.